Don’t you just love these vintage botanical book plates? They show the entire life cycle of the plant, often in hand-painted splendor. 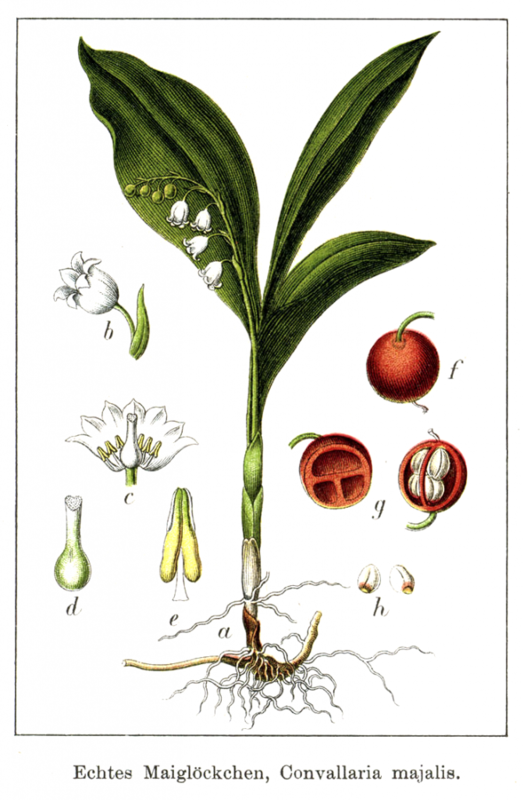 This convallaria majalis or lily of the valley drawing depicts one of my favorite flowers. It may be the first botanical illustration I’ve shared with you from Deutschlands Flora in Abbildungen but, hopefully, it won’t be the last. It is the work of Johann Georg Sturm (1742-1793) and Jacob Sturm (1771-1848) engraved and or painted the beautiful botanical drawings. Like most books from 1796, the plates were individually hand painted. Johann was a natural history illustrator from Germany. His son, Jacob, was a well-regarded entomologist and engraver. Lily of the valley is one of my favorite flowers. The white, bell-shaped flowers form on a thin stalk that grows between 2-3 leaves. In the fall, they form bright, red berries that are a favorite of many birds; though are poisonous to humans and domesticated animals. I do have a larger version of this lily of the valley drawing. Simply click on the drawing above to access it.